These decadent chocolate and caramel tarts are no more difficult to pull off than a batch of your favorite cookies. Because they’re made with a slightly sturdier pastry than regular sweet dough, the shells are easy to remove from the molds once they’re baked. Since tartlet molds come in different sizes, use what you have on hand; even mini muffin tins work. Just measure the top of the tin and use a cookie cutter 1 inch bigger than the cup to cut out your circles of pastry. Place butter, salt and sugar in food processor. Process until mixture is light and fluffy. Add flour and water and just combine. Remove from processor and shape into a flat disc. Chill for 30 minutes. Roll out pastry about 1/8- inch thick. Using a cookie cutter, cut circles to fit your tartlet tins. Ease pastry into tins and, if it breaks, pat it together again. If there is enough pastry, make a rim around each tart. Freeze pastry for 30 minutes. (Any leftover pastry can also be frozen for another use.) Prick base of pastry with a fork. Bake tartlets 10 to 12 minutes or until golden. Cool in tins. Combine sugar, water and corn syrup in a heavy pot. Bring to a boil and boil until sugar turns an amber color (about 4 to 5 minutes). Remove from heat and stir in cream until well incorporated. Stir occasionally as mixture cools. Chill until mixture hardens. Break up chocolate and place in a heavy pot with 1/2 cup whipping cream. On low heat, slowly melt chocolate, stirring until the mixture is smooth. Stir in egg and vanilla and continue to stir together until mixture is slightly thickened (about 2 minutes). 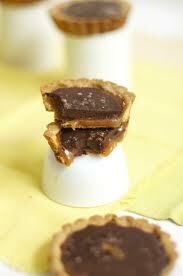 Place 1 teaspoon caramel in base of each tart. Top with 1 teaspoon chocolate mixture. Thanks for the recipe Aunt Carol!